CSX released its first quarter earnings result on April 19 and conducted a conference call with analysts the next day. The company reported a considerable increase in its Q1 earnings driven by both top line growth and the impact of the company’s productivity improvement initiatives. Improving economic conditions translated into a broad-based recovery in the company’s shipment volumes, particularly metals and minerals shipments. Improving domestic steel production amid moderating competition from imports drove rail shipments of steel higher, with CSX’s Metals and Equipment sub-category registering a 13% year-over-year growth in shipments. In addition, improving construction activity drove Housing & Construction shipments 9% higher on a year-over-year basis in Q1 2017. 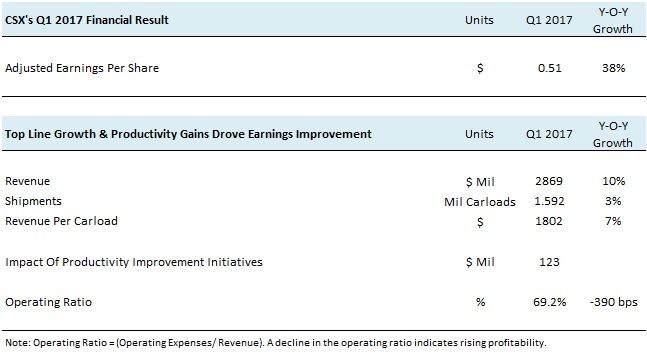 Besides shipment growth, core pricing gains and higher fuel surcharge revenue contributed to the growth in CSX’s revenue. CSX realized $123 million worth of margin improvement in Q1 2017 through its productivity improvement initiatives, which facilitated higher asset utilization and the rationalization of labor costs. With the recent appointment of Hunter Harrison as the CEO of CSX, the company has set itself ambitious targets for productivity improvements going forward. CSX plans to implement the ‘Precision Scheduled Railroading’ model, which helped improve Canadian Pacific’s operating ratio from 81% in 2011 to 59% in 2016 under Mr. Harrison’s leadership. The Precision Scheduled Railroading model involves making freight deliveries to a strict schedule and stringent monitoring of adherence to the schedule. Building on the the success of CSX’s productivity improvement initiatives in Q1, the top management estimates that the company can achieve a mid-60s operating ratio for the full year 2017. Moreover, the operational changes instituted by the company could lower capital spending by around $100 million in 2017. Thus, beginning with 2017, CSX plans to aggressively pursue higher profitability under its new management. In order to incorporate the planned operational changes at CSX into our model for the company’s stock, we have suitably modified our margin and capital expenditure estimates. Our new margin forecast represents a 300 basis point increase over our previous estimate by the end of our forecast period, while our new capital expenditure forecast represents a 10% decline over our previous estimate (in absolute terms, not as a % of EBITDA) by the end of the forecast period. These changes to our forecast have translated into our new $47.98 price estimate for the company’s stock. Have more questions about CSX? See the links below. Why Has CSX’s Stock Price Risen Sharply Over The Past Week? What Does The Recent Top Management Shake-Up Mean For CSX?